Future pay items can be scheduled in for an employee, in advance of processing such pay periods. Any future pay period can be selected, in order to schedule such payments and deductions. 1) Select the pay period - using the payment schedule bar, select the pay period you wish to schedule future pay items for. 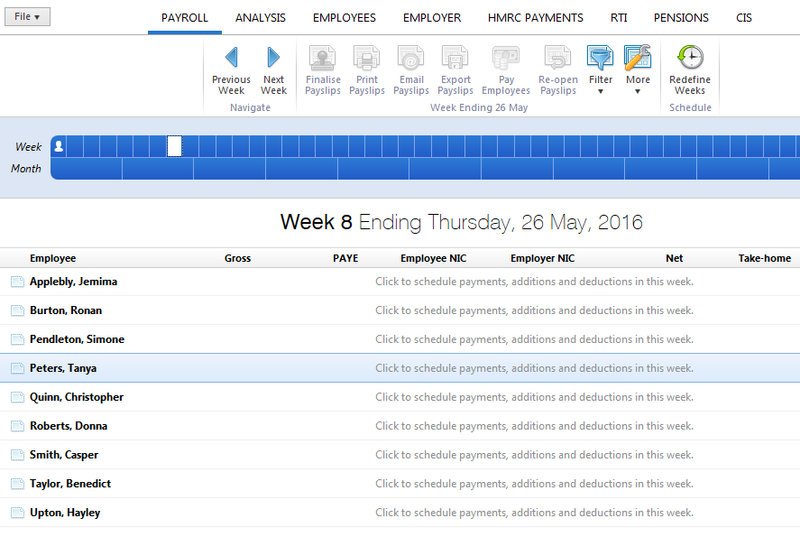 2) Select the Employee - select the employee for whom you wish to schedule future pay items. 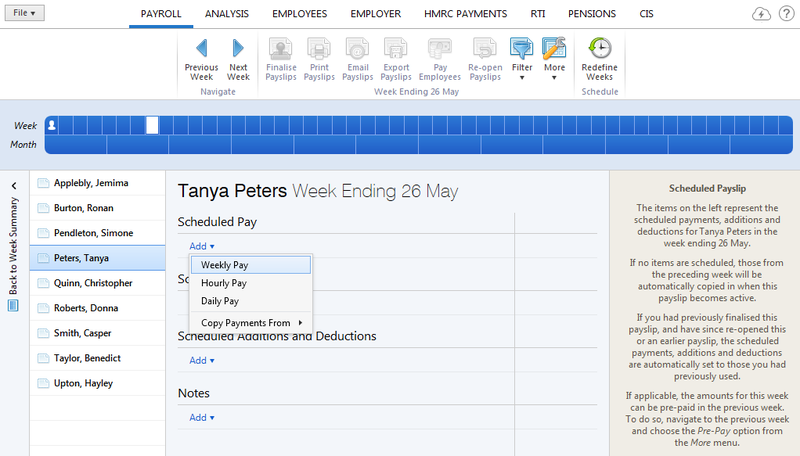 3) Pay Details - to schedule a change to an employee’s periodical pay, click the Add icon within the Pay section. Select the type of pay you wish to enter and enter the amount accordingly. 4) Additions - to schedule an addition for the pay period chosen, click the Add icon within the Scheduled Additions and Deductions section. Select the type of addition you require and enter the amount accordingly. The frequency of the scheduled addition can be now be set by clicking the Edit button beside it. The addition can be set to be for this period only, to repeat until manually removed or to repeat up to and including a period specified by the user. 5) Deductions - to schedule a deduction for the specified pay period chosen, click the Add icon within the Scheduled Additions and Deductions section. Select the type of deduction you require and enter the amount accordingly. 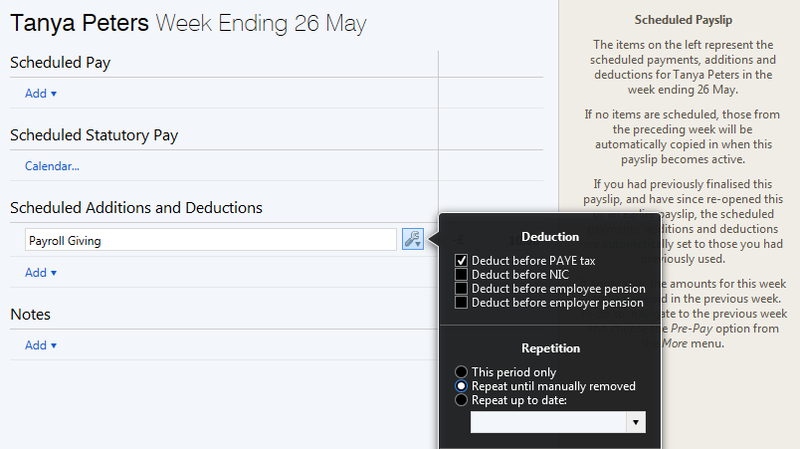 The frequency of the scheduled deduction can now be set by clicking the Edit button beside it. The deduction can be set to be for this period only, to repeat until manually removed or to repeat up to and including a period specified by the user. 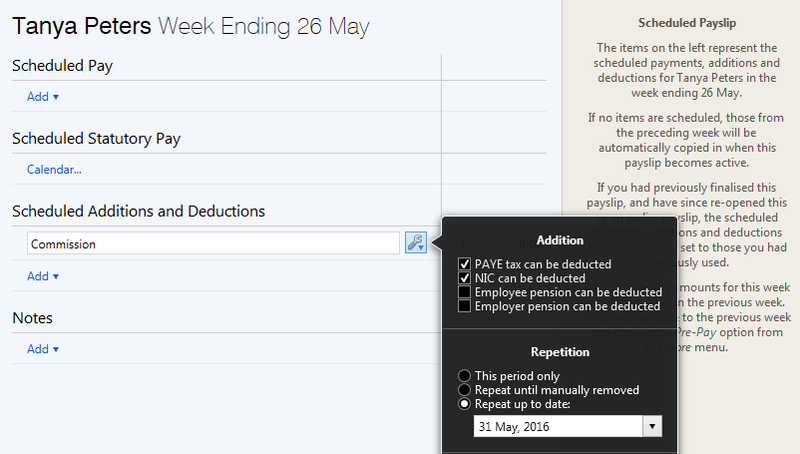 Statutory payments can also be scheduled in for the specified pay period using the Calendar utility. Please refer to the Support section for more information on processing statutory payments.